Washington – Former Vice President Al Gore said on Thursday that Americans must abandon fossil fuels within a decade and rely on the sun, the winds and other environmentally friendly sources of electric power, or risk losing their national security as well as their creature comforts. Mr. Gore called for the kind of concerted national effort that enabled Americans to walk on the moon 39 years ago this month, just eight years after President John F. Kennedy famously embraced that goal. He said the goal of producing all of the nation’s electricity from “renewable energy and truly clean, carbon-free sources” within 10 years is not some farfetched vision, although he said it would require fundamental changes in political thinking and personal expectations. Although Mr. Gore has made global warming and energy conservation his signature issues, winning a Nobel Prize for his efforts, his speech on Thursday argued that the reasons for renouncing fossil fuels go far beyond concern for the climate. In it, he cited military-intelligence studies warning of “dangerous national security implications” tied to climate change, including the possibility of “hundreds of millions of climate refugees” causing instability around the world, and said the United States is dangerously vulnerable because of its reliance on foreign oil. 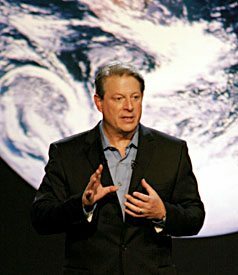 Doubtless aware that his remarks would be met with skepticism, or even ridicule, in some quarters, Mr. Gore insisted in his speech that the goal of carbon-free power is not only achievable but practical, and that businesses would embrace it once they saw that it made fundamental economic sense. Mr. Gore said the most important policy change in the transformation would be taxes on carbon dioxide production, with an accompanying reduction in payroll taxes. “We should tax what we burn, not what we earn,” his prepared remarks said. The former vice president said in his speech that he could not recall a worse confluence of problems facing the country: higher gasoline prices, jobs being “outsourced,” the home mortgage industry in turmoil. “Meanwhile, the war in Iraq continues, and now the war in Afghanistan appears to be getting worse,” he said. By calling for new political leadership and speaking disdainfully of “defenders of the status quo,” Mr. Gore was hurling a dart at the man who defeated him for the presidency in 2000, George W. Bush. Critics of Mr. Bush say that his policies are too often colored by his background in the oil business. And it can change, he said, citing some scientists’ estimates that enough solar energy falls on the surface of the earth in 40 minutes to meet the world’s energy needs for a year, and that the winds that blow across the Midwest every day could meet the country’s daily electricity needs. Senator Barack Obama of Illinois, the presumptive Democratic candidate for president, immediately praised Mr. Gore’s speech. “For decades, Al Gore has challenged the skeptics in Washington on climate change and awakened the conscience of a nation to the urgency of this threat,” Mr. Obama said.